We love gardening! I really wanted to add lettuce and herbs to our garden since we eat so many salads. A lot of salad type items have a cocktail of insecticides to ensure that bugs don’t eat the foliage, but I don’t really want me or my family to be exposed to those insecticides. Organic vegetables are really expensive in our area. But we live in a climate that is too extreme (really hot and too cold) to grow salad greens year-long. Enter the indoor hydroponic garden. It is fairly inexpensive to setup, very easy to maintain, and you get to control what goes in or on your vegetables. The setup costs less than $20. If you have a really sunny spot in your house, you could forgo grow lights. We don’t have a really sunny location, so I use a $75 light that I bought from Amazon. I originally bought really cheap grow lights from Wal-mart. I think they were less than $10 each. Unfortunately, they were too weak and my little seedlings suffered. The grow light I use has 4 high-output T5 bulbs. It is a beast. I highly recommend it. Our herbs and salad green hydroponic garden saves us about $50-75 a month that we were previously spending for sub-par greens at our local grocery. Plus, it’s so easy to maintain. The most maintenance is done at the beginning. I generally finish it within my toddler’s nap time. After that, you just need to trim/eat what you grow. I love it, because we’re constantly on the road. Our outdoor garden is watered with a timer (get yourself one, thank me later) and since you don’t need to constantly water this indoor garden, it’s pretty self-sufficient. We left for a business trip and didn’t see our garden for two weeks. Here is the before and after. 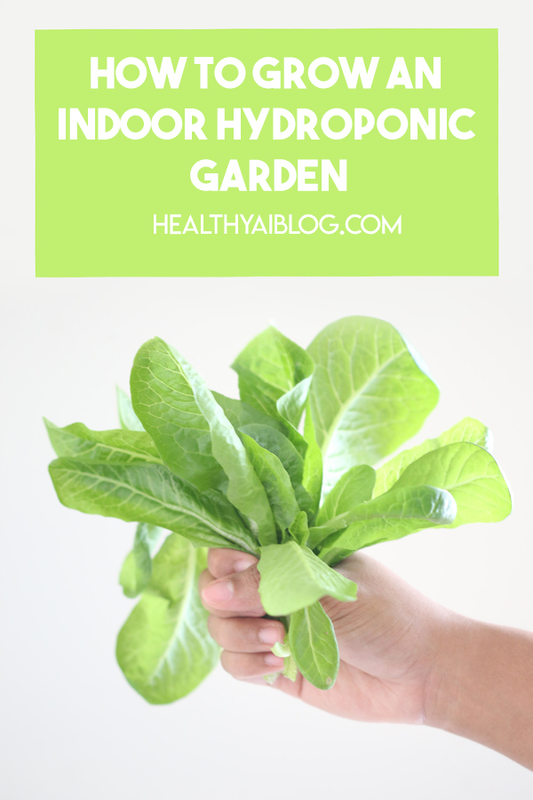 Check out the video above for more info to starting your indoor hydroponic garden! This is really impressive and I like the idea of grow lights. I’ve always struggled since we have big trees in our yard (which are great at keeping the house cool but not good for light) and don’t get many good sunny spots. Nothing beats growing your own herbs and you’re right, it’s so much cheaper! Thank you so much! Pretty much every house we’ve lived in either had full shade or full sun but blight prone due to humidity. I’ve killed way less plants this way and it’s so much easier! Thank you! It’s a fun and pretty easy project!